Back in 1971, I was 18 and beginning Electrical Engineering at the University. I had documented the Apollo 15 EVAs by recording the audio on tape live from the TV (that was, of course, ages before VCRs and PCs and DVDs) and taking snapshots of the TV screen with a 35mm camera. Around 1990, I got VHS cassettes of all the Apollo TV. The picture quality was rather poor, but I watched them over and over, until SpaceCraft Films produced the DVDs about a decade ago. I graduated in Engineering in 1975 and since then had a rather diversified career, becoming Executive Director of a few non-profit organizations and getting other University degrees along the way, including graduate studies in Theology (really!). And so, last but not least, four years ago, I was asked to take over as General Secretary of the Assembly of Catholic Bishops of Quebec, which is my 'day job' right now. I have a personal web page since 2002, documenting my various writings and lectures. 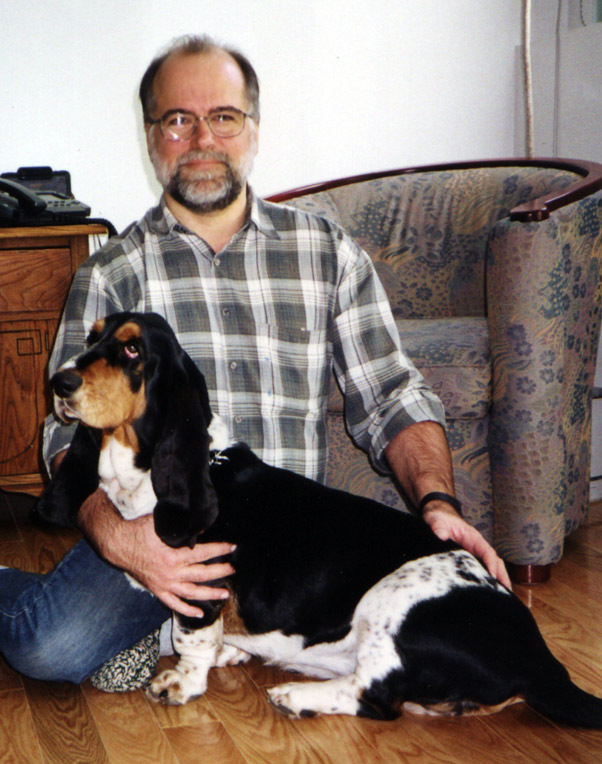 The photo was taken in 2000 of me and my canine friend Véda. I chose the picture because she passed away three years ago and I miss her.